There is a scene in Dhanak, in which two boys are seated on a swing with Pari, the elder sister of one of the li’l fellows. She watches them with affection and mildly chides them for over-eating as they stuff their faces with jalebis. The mini gents feed each other, but it seems not to even occur to either of them to offer her a nibble. Later, Pari sits with her brother Chotu and a child-like man. Again, the man feeds Chotu while not even asking her if she is hungry, and again, she seems not to mind at all. It is unclear whether writer-director Nagesh Kukunoor intends us to read Dhanak this way, but his latest film is as much an unspoken comment on the male-centricity of our collective human existence, as it is an endearing road movie about two siblings journeying across a desert to meet Shah Rukh Khan. When Pari sees SRK on a poster for eye donations and later learns that the star is shooting near Jaisalmer, she runs away from home with Chotu to get her favourite Khan’s help to help Chotu. During the risky excursion from their tiny hamlet and across the blazing Thar, they meet a motley bunch of characters who serve as a reminder of the evil that exists in this world while also underlining a fact we too often forget: that the good out there far exceeds the bad. Kukunoor keeps his tone real and the proceedings believable through most of the film. For the most part, Dhanak is consequently both charming and insightful. Even when he stumbles occasionally, the children remain consistently loveable. And stumble he does, such as in the chance encounter with a somewhat clichéd white man (Chet Dixon), the abrupt shift in gears to a mystical realm with a soothsayer (Bharati Achrekar) and the stereotyping of the children’s hard-working aunt (Gulfam Khan) as a mild version of the evil stepmother from old fairytales while their lazy layabout of an uncle (Vipin Sharma) is viewed through a lens of indulgent tenderness. Through all this though, the characterisation of Pari and Chotu, and the incredible child actors playing the two, remain pitch perfect. Their conversations flow naturally, their chemistry is palpable and at no point does Kukunoor try to manipulate us with precocious cutesiness as so many directors do when they are working with such young artistes. The children are surrounded by an array of interesting supporting actors, most especially Vipin Sharma playing their uncle and the attractive Rishi Deshpande as an elderly truck driver. These are strong performers to be up against, but Hetal Gada as Pari and Krrish Chhabria as Chotu are more than up to the challenge. They were just 10 and eight years old respectively when the film was being shot, yet they do not take a single misstep. Producer Elahe Hiptoola reveals that 500 kids were auditioned in Mumbai, Jodhpur, Jaipur, Bangalore and Hyderabad to find this pair. There is more to them than their innate, innocent charm. They were born to be before the camera. It would interesting to see what Chhabria grows up to be, since he currently has the advantage of a baby-like appearance, is of slighter stature than the girl and in the film, has the benefit of playing a bratty, chatty youngster of the kind adults are usually drawn to. She – taller, with a face maturer than her age – is a confirmed quantity though: sweet-voiced Hetal Gada is, without question, a formidable talent. Hats off for the casting win, Team Dhanak! Chirantan Das’ camerawork among those scorching desert sands is eye-catching. Tapas Relia’s songs are uniformly catchy and include a revisitation of the lovely old Dama dam mast qalandar in the stunning voice of Devu Khan Manganiyar. This brings us to a concern with an element in the film’s sound quality though. The transition from conversations (and one actor’s own singing voice) to the playback song recordings is not smooth at all. This audio bumpiness is glaring even to my technically inexpert ears and occurs more than once in the film. It was also a mistake to let Krrish Chhabria himself sing the opening line of Tujhe dekha toh yeh jaana sanam at one point while he has professional playback artistes singing for him through the rest of the film. The contrast between his regular Joe voice and the extraordinary singers who have sung playback for him is needlessly rubbed in our faces considering that Chotu’s singing ability is one of his striking qualities. Overriding any and all reservations are the two children at the heart of this film, their seeming incorruptibility and artlessness, the touching bond they share, Kukunoor’s way with children, his trademark sense of humour, and Dhanak’s faith in faith. Chotu asks Pari one day: Why do you credit X with this kindness being done to us, when Y is responsible for it? She replies: Leave me to believe what I believe, and you believe what you wish. 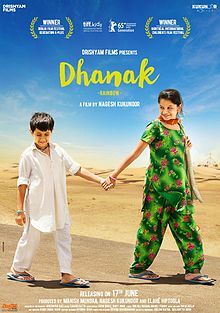 That, ultimately, is what Dhanak is about: allowing the mind to wander where it will, seeing a rainbow (dhanak) in the night, putting your trust in who or what you will – God, miracles or even Shah Rukh Khan. Clearly, stories of siblings and sensitivity towards physical disabilities are Kukunoor’s great strengths. 2005’s Iqbal featured a warm relationship between a deaf-mute cricketer and his supportive younger sister. That film stands head and shoulders and a whole human being above his other works. Dhanak, warts and all, is a reminder of the best that this director can be. It is hard to say which is the star of this film: the writing of the child characters or the manner in which the director has just let them be or the child actors who play them or the fact that Chotu is not made an object of pity by the film? There’s a whole constellation twinkling at us off screen from this warmly appealing, life-affirming film. PS: So does Shah Rukh Khan make an appearance in the film? My lips are sealed.